Nicole's Needlework: Third Time's a Charm?? Welcome to the loony bin once again! I was going through my linen and getting it organized and came across my old Ruth Bacheler wip. I couldn't stop looking at it and I realized I really liked it. I was seriously thinking of picking it back up and working on it again. But wait, I started it over, on silk. Shouldn't I be happy with that?? I should, but of course - fickle me, I'm not. I really like Anne's finish over at Tempus Fugit. I love the colors on her sampler. I don't know why they are so different than mine - dye lots, lighting? Who knows, but I knew I liked it. 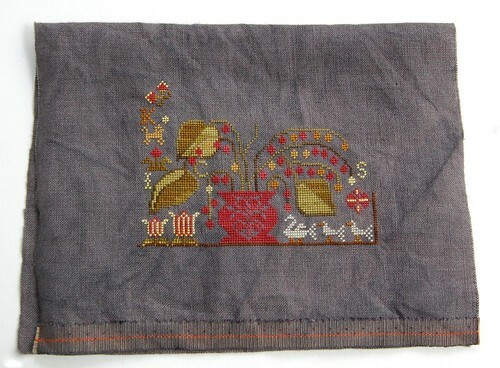 Well, Katrina also liked Anne's sampler and she came up with a conversion of her own by looking at the colors Anne used. I once again borrowed Katrina's conversion (she so nice to share). She has a great eye for color! So I ripped some colors from my old sampler last night and put in the new colors today. I'm very happy with how it's turning out. Life is too short for sanity! Where's the fun in that? I am glad I am not the only certifiable stitching nut out there!! After all we have to enjoy what our needle and thread is creating! Glad you are enjoying this one and your Miss Lila, is just so gorgeous!! I think this version looks great--as does the other version! You have to go with what makes you happy, though, and what makes you want to pick it up again! Love your Miss Lila, too. I love this version of Ruth and Miss Lila is gorgeous!!! miss lila is coming along nicely! and the new version looks great. Oh yes, These colors are fabulous!! Better to change your mind when you did right? Can't wait to see more. Miss Lila's house is really coming along too, love it on the ink spot. I agree, Nicole -- the colors of the silks on my Ruthie are different from Tempus Fugit Ann's too. But I like them well enough. Your Ruthie is turning out to be like my Mouline Rouge! lol! Love Miss Lila! 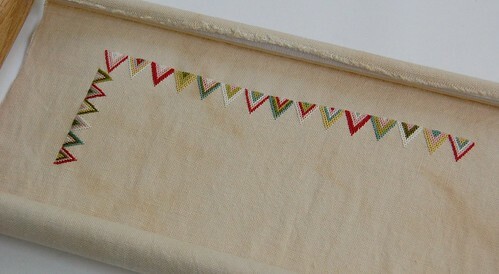 I think a certain amount of insanity is required of us stitchers! You're making nice progress on both pieces, Nicole. Yeah, you're pretty looney but then your work turns out so gorgeous that the looney part doesn't count! I love miss Lila - very pretty! ps let me get this straight - Miss Lila is sane, but Ruth isn't, right? You are too funny!!!! I really like Miss Lila's House...love the colors on that fabric. Nicole, I didn't like Miss Lila's House until I saw your progress on it. Wow, it's stunning. And looks perfect on the Ink spot. And I don't think any of us think you're crazy for liking your first start! Go with what pleases you the most--or do both of them. I'm sure you know someone who would love one as a gift. Your Miss Lila's House is coming along so nicely! Your progress on Miss Lila's House is so nice! I love t hese colors! Great work! I must admit that I love both your versions. But the most important thing is that you are enjoying what you stitch. Miss Lila looks wonderful, I think I'll have to have this chart, lol. 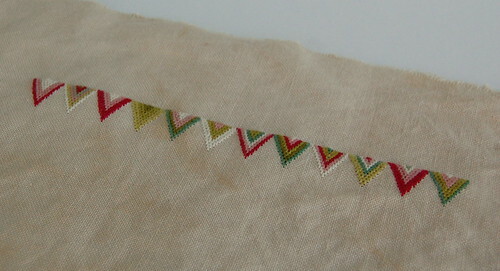 Oh, I love those colors!Your stitching is always beautiful! love to see your WIPs and they look great. I'm loving Miss Lila! Gorgeous!! Very pretty! I do love those colors. I've thought about tweaking them a bit more but I am trying to restrain myself, LOL. Oh, this post makes me feel so much better. If I can't be sane, at least there's plenty of company out there. I think both Ruth's are quite beautiful, but a girl's gotta do what a girl's gotta do. Whatever blows your skirt up! I started And They Sinned 3 times! 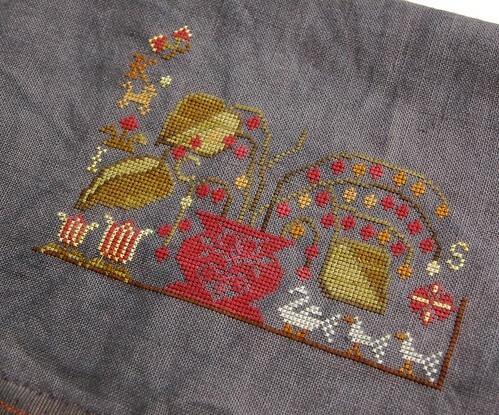 First time I used the called for Sampler Threads. Then I decided I had to have the silk pack from Vicki Clayton. But I didn't like the colors together very much so I restarted it for a 3rd time back with the Sampler Threads. Of course it will take me years to finish, I'm still on the cloud at the top! Looks great! 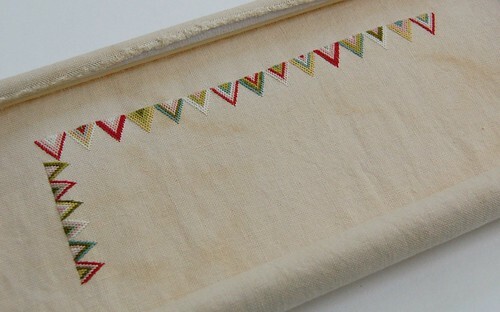 Nicole, I must ask you what type of scroll frame you use...how do you attach your linen? I'm researching different frames...suffering from some hoop-hand and may go the frame route. Thanks!